Progesterone is first produced by the corpus luteum of the ovary and production from this site is necessary for the first 8 weeks of pregnancy. From implantation of the embryo onwards for 40 weeks the placenta takes over the production of progesterone (see graph). The levels of progesterone increase dramatically all throughout pregnancy. Progesterone production is necessary for the safe maintenance of pregnancy and all pregnancies will fail if progesterone production is too low. Many women with infertility, implantation failures and/or miscarriages produce low levels of progesterone as seen in the bottom line of the graph. 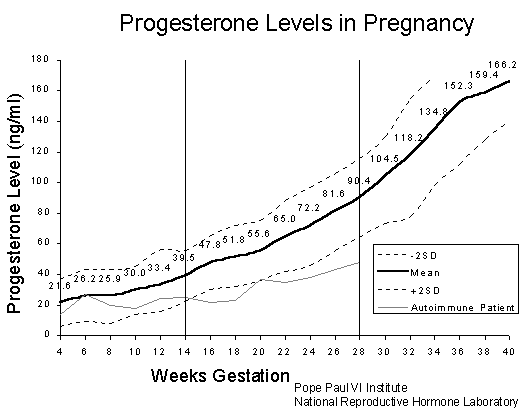 These women require progesterone supplementation to bring them into the safe levels (see thick line, which indicates mean values, on graph and limits of two standard deviations of the mean). Based on our experience in treating autoimmune women, this supplementation must continue until the 16th week is completed. When progesterone supplementation is given to a mother, its half life in the blood is very short. In four minutes it begins to be excreted rapidly into the urine. The most efficient route to take the progesterone to insure the best blood levels and the longest survival of the progesterone in the blood is to use vaginal suppositories. The next best route of administration is to take injections of progesterone. The least effective is to take the progesterone by mouth.